As a promotion for new members, WBX is offering a £25 free bet. Those who open accounts during the advertised promotional period (subject to change), get their first £10 free bet as soon as they have won or lost a total of £100 on the Exchange. And additional £5 free bet is awarded every time the new member earns 20 WBX Lifetime Points. Points are earned based on the amount of commissions paid month by month, typical at a rate of one point for each £1 collected. 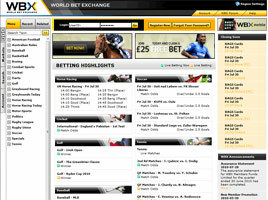 WBX, the World Bet Exchange, launched amid much fanfare in 2006. Even before the first wagers could be made online, the firm was already Britain's fifth biggest race sponsor, following a two-year campaign to make its name known. Over 10,000 bettors queued up to open accounts, shooting WBX straight onto the leader board among U.K. race & sports books from day one and setting the stage for expansion on a global scale. Today, WBX is ranked number five in the world among betting exchanges—a somewhat controversial platform that allows bettors to wager directly with each other on various outcomes, both winning and losing, in races, sports, politics, and entertainment events, including the Academy Awards and reality television shows. WBX started right off by creating "a unique racing sponsorship initiative". It linked Britain's top three hurdle races - Newcastle's Fighting Fifth Hurdle, the Stan James Christmas Hurdle at Kempton, and the Champion Hurdle at Cheltenham - with a £1 million bonus. This new "triple crown" included a £100,000 prize for the stable staff responsible of the winner, incentivising not only the betting public but groomers as well. It is aggressive promotion like this that has put WBX uppermost in the minds of competitors and forced the entire industry to take a fresh look at the way bets are made and paid out. Because the wagers are placed with other bettors online, not the bookmaker, punters can choose to back an outcome as they would normally, or else play the role of bookmaker and "lay" an outcome. This puts WBX in the position of simply "trading" the betting markets, rather like a stock exchange. Take for example golf's annual Ryder Cup. While traditional sportsbooks are backing the USA at odds of 2.98 and that is the only wager available, WBX has offers ranging from 2.9 to 2.96 backing the USA and lay offers ranging from 3.15 to 3.4. Lay offers on Europe and Ties are also available. As lay bets and backed bets match up, the wagers are set. At the start of the first match of the Ryder Cup, any unmatched bets are automatically cancelled and the market is converted to Live Betting. Prices are set exclusively by members of the Exchange. For its role in the wagering, WBX takes a commission of no more than 3%. The variety of events that can be wagered on is greatly expanded by this format, because the bettors themselves what is worth setting odds on. Of course, WBX offers the usual sports such as Football, Cricket, Rugby, Tennis, Greyhounds, and Horse Racing, plus all the American specialties - MLB Baseball, NBA Basketball, and NFL Football. But it also has categories like Combat Sports for all types of UFC bouts, TV Specials such as Big Brother 11, and who will win the 2012 Presidential Election in the United States. Other promotions here have included £30 Deposit Bonus for deposits made through Moneybookers and special tie-ins with companies like Chauffer Bikes and 121Sports to offer additional bonuses. Loyalty Discounts and Loyalty Refunds are also offered.